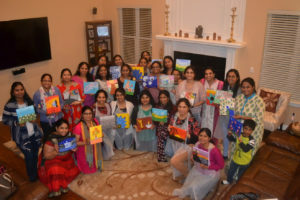 Detroit Convention Womens Committee lead by Chair Bharathi Aytha and Co-chairs Kiranmai Pallerla and Sushma Ellendula have redefined the Women Power by superbly initiating, planning and executing a fun painting event. This event not only brought them all together but helped them know one another better, increased the bonding between them, brought out their hidden talent and provided them an opportunity to be themselves away from busy family lives. A big shout out to Kanchana Perumalla who offered her basement for this event and organized it like a professional workshop. Thank you all the local NRIVA women for their passion, willingness and support to NRIVA. Lastly, this initiative to donate the proceeds of the money raised by auctioning the paintings is really commendable.